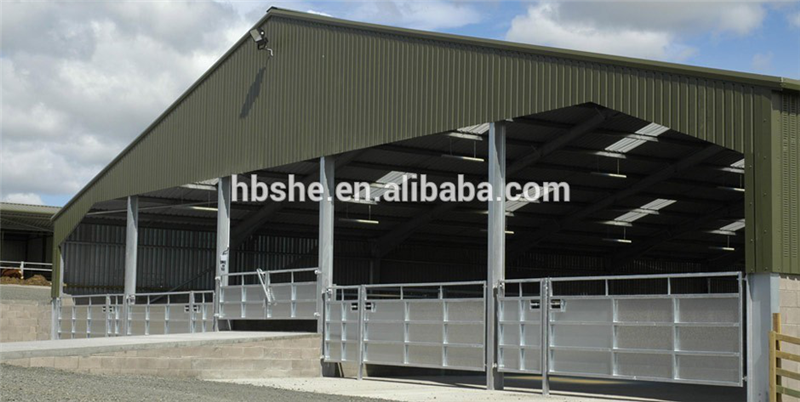 Sanhe cattle shed have three types of cattle shed ,open style ,semi-open style and close style. 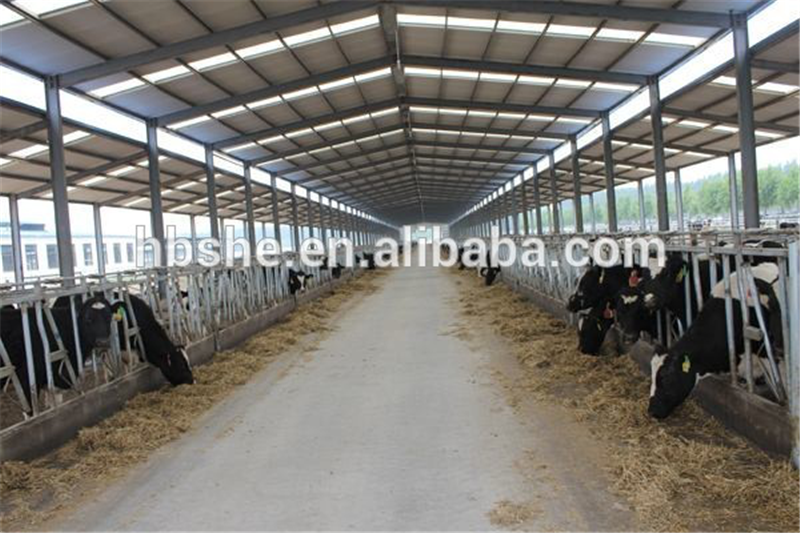 Open style cattle shed usually has one wall, three side is open,even four side is open.semi-open style has three walls,one side is open. 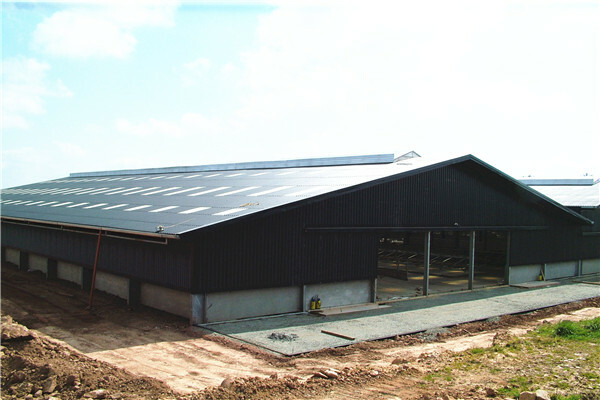 Sanhe Cattle Shed is a kind of light steel structure building. The frame of the building consists of H section steel columns, H section steel beams and C or Z section purlins. 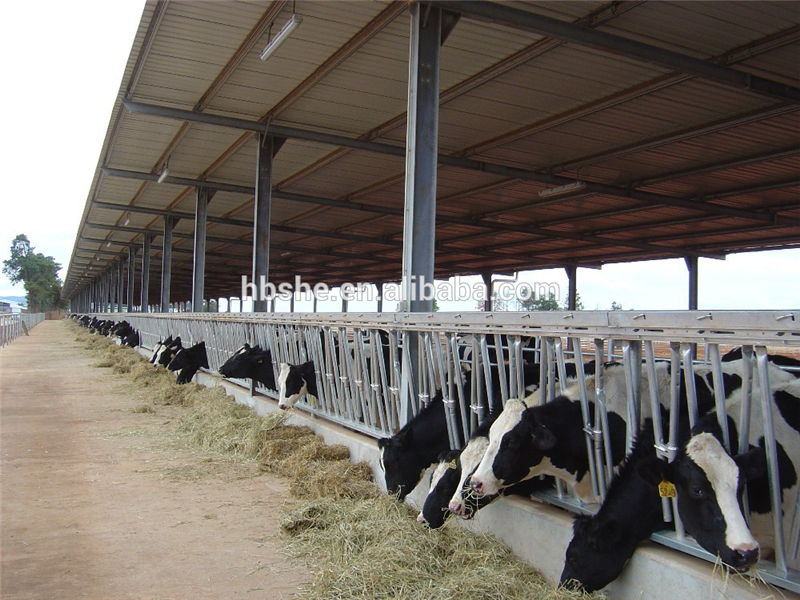 Generally Sanhe cattle shed have three types of cattle shed ,open style ,semi-open style and close style. Close style cattle shed has whole wall and roof, some windows on wall. You can choose which type of house you want, or we can design depending on your feeding requirements and local climate. 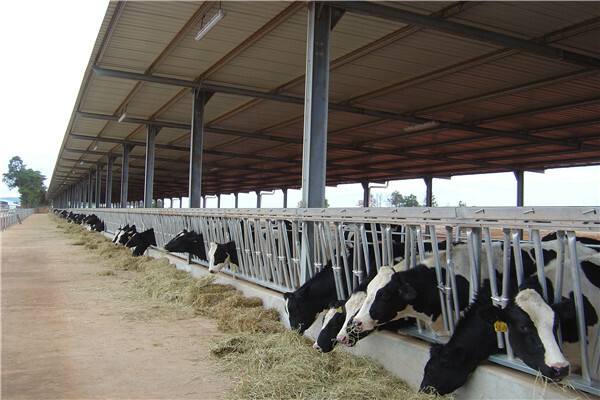 Open style cattle shed usually has one wall, three side is open,even four side is open.It just use steel column or steel frame to build as a cattle shed.This kind of cattle shed, the design is very simple, low cost, and good day lighting and ventilation , but heat preservation is poor, so apply to the area with high temperature all year round. 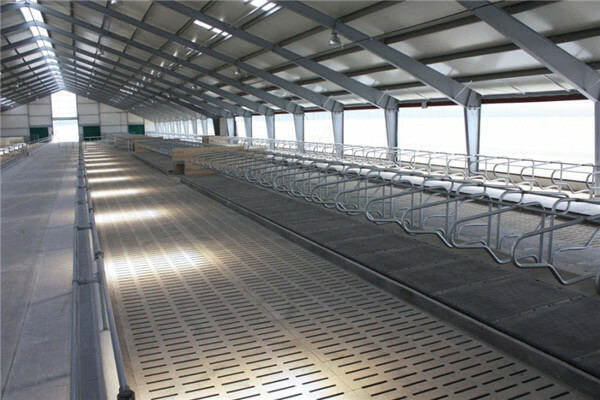 Semi-open style cattle shed has three walls,one side is open.This kind of cattle shed is suitable for areas that are not too cold in winter. 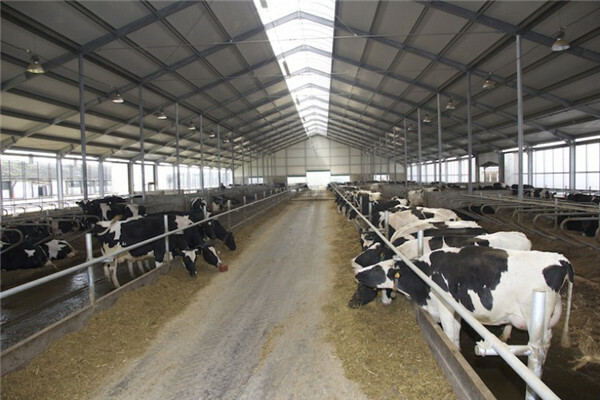 Close style cattle shed has whole wall and roof, some windows on wall for lighting, skylights on the roof or Windows on the wall are for ventilation. In cold climates, it is very important to keep warm in the cow shed. so close style cattle shed is a best choose. 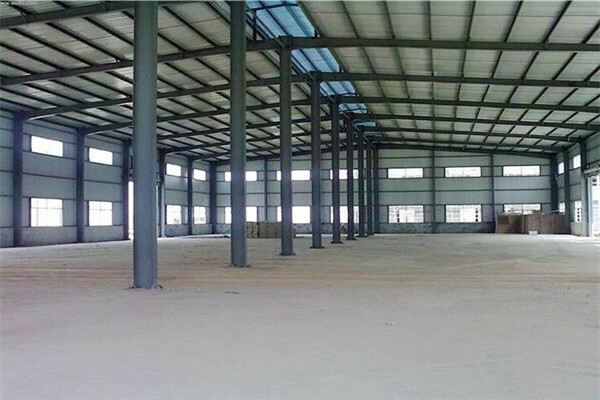 we have been a professional manufacturer of steel structure building,container house,prefabricated house ,sandwich panel and color steel sheet with ISO9001 certification. Quality control and stability: Applied with high quality, each product is produced under strict quality control at every manufacturing process from raw materials to final testing which ensures our products come with perfect performance. Our customer service team offers you Pre-sales and after-sales service. -Professional design and engineering team: Full solution for steel structure design. 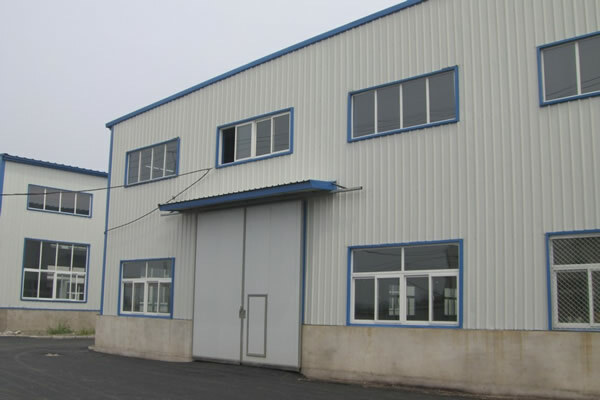 -Procurement and Manufacture for all material for prefabricated building. We have a professionalprocurement team to make sure all the materials are with good quality. -Site management & Installation supervision, We could send our engineers to help for the installation supervision, you just need to prepare a team which know normal construction works will be OK.
A: We are factory. so you will enjoy the best price and competitive price. Our factory covers an area of 60,000 square meters. Q：Whats the quality assurance you provided and how do you control quality ? A: Established a procedure to check products at all stages of the manufacturing process - raw materials, in process materials, validated or tested materials, finished goods, etc. Q：Can you offer designing service? A: Yes, we have engineers and designers who have more than 15 years of experience join us. We could design full solution drawings as per your requirments. Q：Do you offer guiding installation on site overseas? 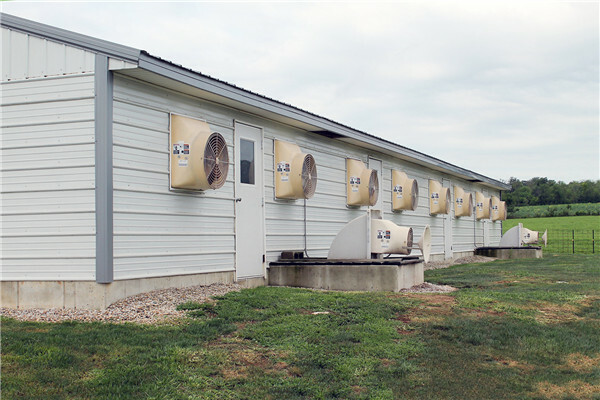 A: Yes, we can provide the service of installation, supervision and training by extra. We can send our professional technical engineer to surpervise installation on site overseas. 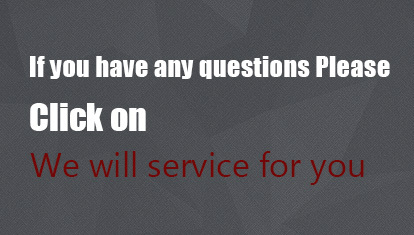 Please leave your needs,and I will send you the details about your questions! If not, the metal steel sheets will be OK. The cost of the latter will be much lower than that of the former.